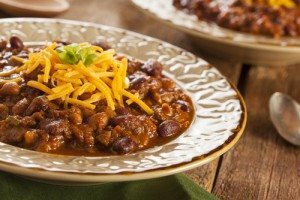 Calling all chili lovers! Chili might just be the perfect winter meal. It warms you up, and it’s chock full of healthy ingredients. Plus, it’s practically a requisite dish at a Super Bowl party. You might not think of adding sweet stuff to chili, but unsweetened chocolate actually blends well with chipotle chiles. This recipe also includes ground turkey, brown sugar, chopped green onions, pinto beans, tomatoes and bell peppers. It serves 8 and is simple to prepare in a Dutch oven. This hearty recipe features bacon and ground beef chuck, along with a bottle of amber beer. It also has a nice blend of onions, bell peppers, spices, black beans and plum tomatoes. Prep time is just 20 minutes, and the recipe serves 6 to 8 people. It’s sure to be a hit at a Super Bowl party. Zucchini, yellow squash, onion and meatless crumbles are the stars of this recipe. It’s super fast to make—it will take less than 30 minutes. It’s perfect if you need to whip up some chili at the last minute. This inventive recipe features pork and black beans, along with bacon, dark beer, and poblano and chipotle chiles. It’s especially tasty when you serve it with shredded cheese, sour cream, avocado slices, lime wedges and tortilla chips.